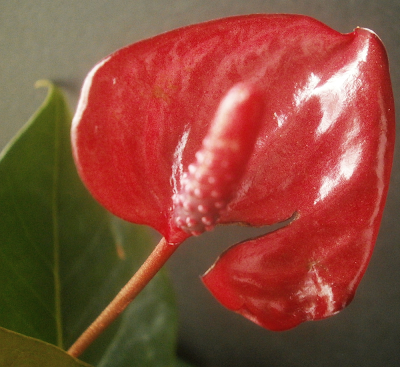 Due to unanticipated levels of family chaos, your regularly-scheduled Anthurium update post is postponed. Here is a photo of Sheba in its stead. Yeah, this photo didn't really work. I'm hoping to tie this Anthurium update to the stuff I've been learning from the new book about breeding them, but there's an awful lot of stuff in the book, and an awful lot of new stuff with the seedlings, so I wound up kind of overwhelmed. 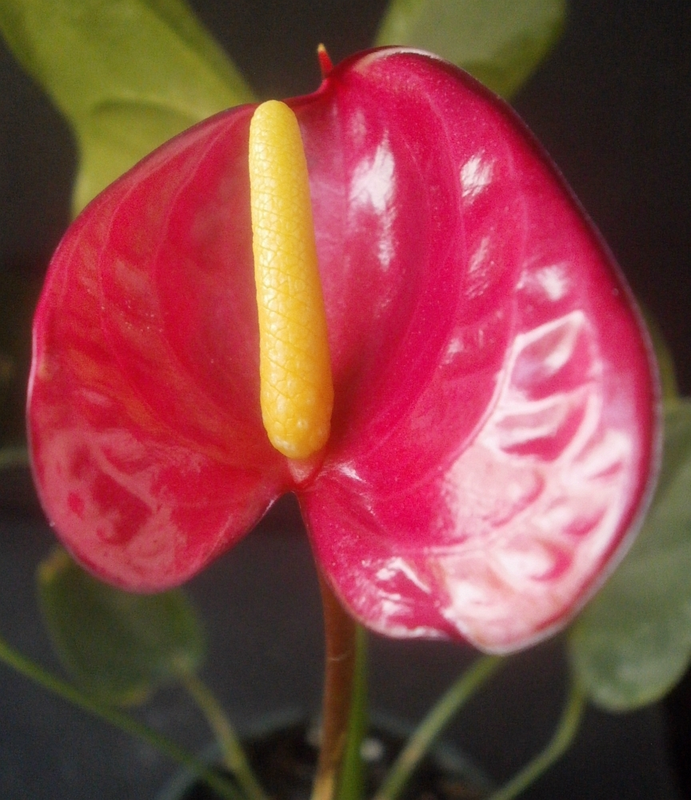 Possibly if I split it up into enough small posts, it'll be easier to do, though depending on your level of interest in Anthuriums that might be more than you really want to know. But I do have to tell you some things, however I do it. So let's try jumping into that and see how it goes. There are 432 Anthurium seedlings here, officially. Of those, 58 (13%) have at least attempted to bloom at some point, and 40 (9%) have actually produced a mature inflorescence. Of the remaining 18 that have attempted to bloom but haven't actually bloomed, 14 are working on a bud now, and 4 produced a bud, aborted it, and haven't started a new one yet. It's not clear how many seedlings have managed to be pollinated so far. 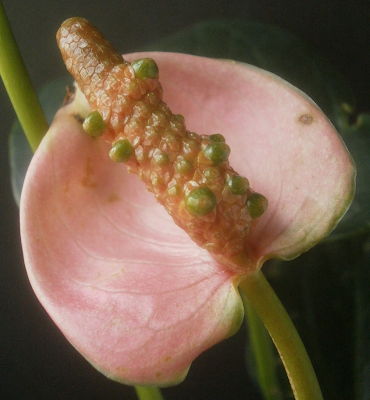 It takes a long time for anything visible to happen to a spadix when pollination is successful. The F2 generation is definitely underway, though, thanks to #276 ("Zach Religious"). He was pollinated, he produced mature berries, the seeds were removed from the berries and sown on vermiculite, and 23 out of 24 seeds have germinated. 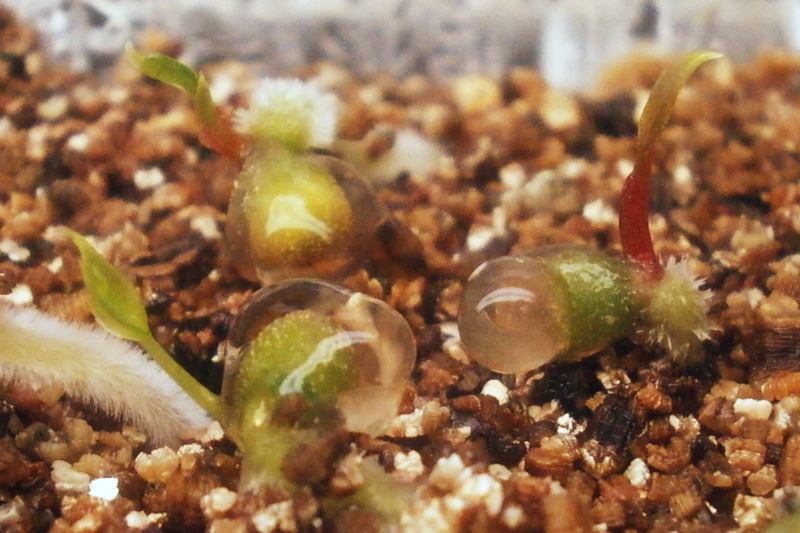 Seedlings from #276 ("Zach Religious"). 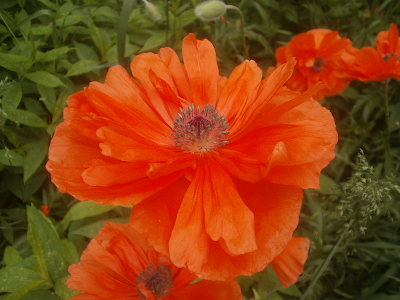 These were sown on 15 May; the photo was taken on 7 June. Barring catastrophe, we should be seeing the first blooms from this group in about November 2015. 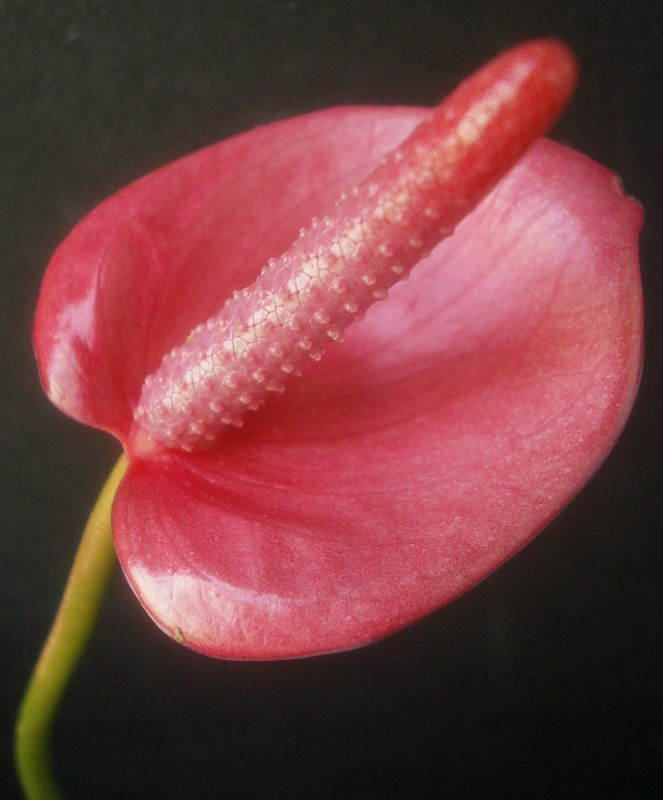 #271 ("Wanda Reulthemal") has also definitely been pollinated, and has maybe 20 developing berries on a single spadix. She'll be up next. In the last week, it's become clear that #239 ("Russ Teanale") and #247 ("Selma Carr") have been pollinated as well. Not only that, but it looks like every. Single. 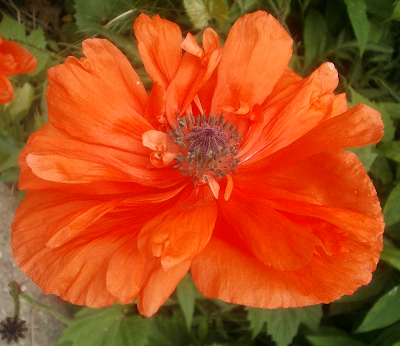 Flower. on their spadices is developing a berry, which will be fun when it comes time to pot them up. There also appear to be a few berries developing on #059 ("Bijoux Tuit"), #234 ("Ross Koz"), #245 ("Sawyer Ad"), #005 ("Chad Michaels"), #063 ("Audrey Quest"), and #273 ("Wes Coast"), though most of those look like they'll produce maybe ten seeds at most. Still, though, that's nine confirmed or likely pollinations, so the second generation will be getting a lot bigger soon. 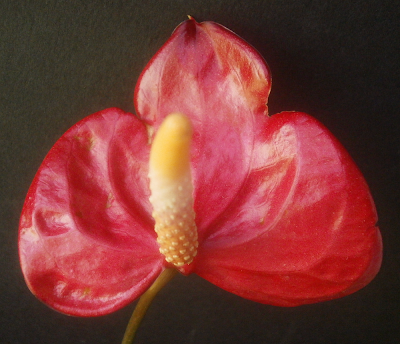 Since the last Anthurium update, 11 seedlings have produced a first bloom. Some of these, like #232 ("Rhoda Badcek"), are perfectly adequate flowers but nothing we haven't seen before. Anne just doesn't work for me because she's doing three things Anthuriums are not supposed to do at the same time. One, she's got thrips damage (the irregular brown patches on the spathe), though that's arguably my fault, not hers. Two, the spathe is small. Three, the spathe is also badly reflexed, which is a vocabulary word from the book. 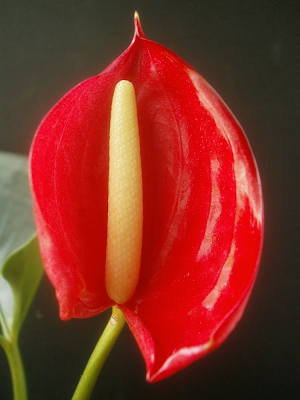 Most Anthuriums grown for indoor container cultivation will have spathes that are more or less upright and cupped around the spadix, when they first open. 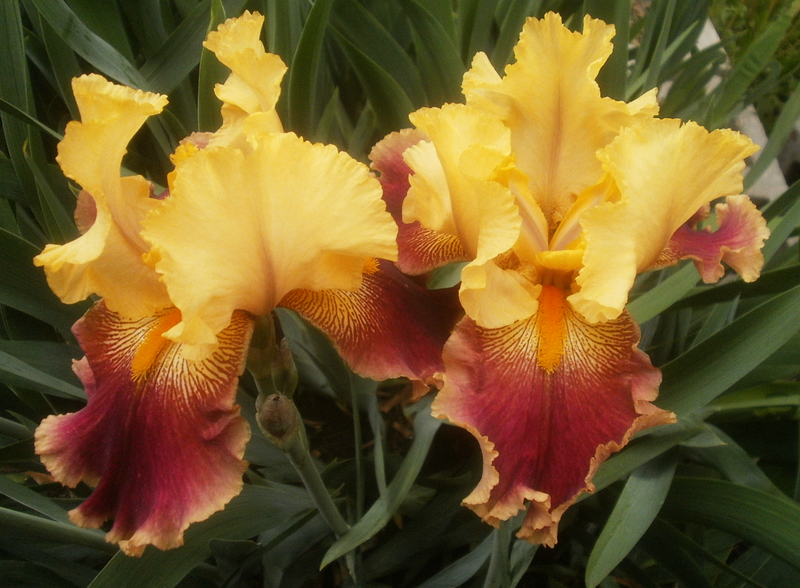 Your better varieties will stay that way as the blooms mature, too. Anne, on the other hand, flipped her spathe back away from the spadix almost immediately, much like a dudebro popping the collar on his polo, with similar consequences for her attractiveness. And I don't know what's going on with that spadix, but it's not helping the overall look. Initially it was sort of a light peach (Colin is one of the three palest spathes so far, though that doesn't photograph well; anything too dark or too light gets its color adjusted automatically by the camera.) 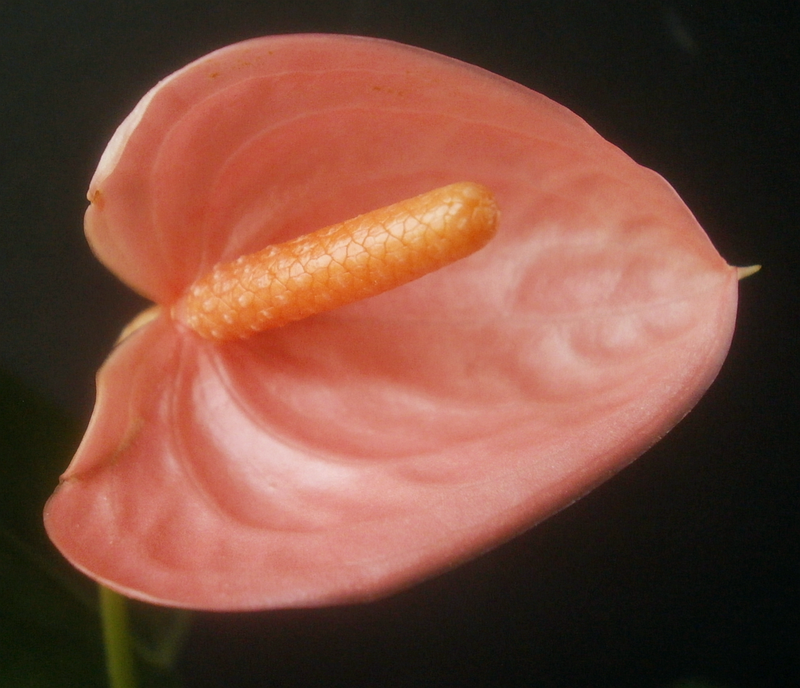 with a peach/orange spadix; it's aging into pink with an orange spadix, but I dig both versions. 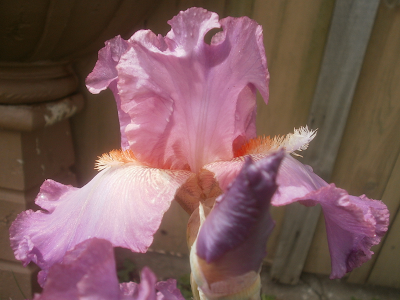 It also makes no damn sense: the seed parent is the NOID purple. It's not even a nice pale lavender kind of purple; it's pretty dark. There is no way this color should be able to come from that color. (I'm going to try to explain that in Part 2. Emphasis on "try.") Regardless of how it got here, though, I like it. We've also finally gotten a bloom from #231 ("Rhea Listick"), who had previously aborted her first attempt, right as it was ready to open. Not a new color -- it's very similar to #035 ("Alyssa Edwards") -- but this is a color I like, so I suppose it was worth the wait. The spathe is smaller than Alyssa's, for now, but a lot of the seedlings produce larger blooms as they mature. Rhea also seems to be more blistered than Alyssa. Blistering is the quilted, lumpy texture on some spathes, where the major veins in the spathe are raised above the rest of the spathe. Blistering is for some reason very desirable in cut flowers, less so for potted plants. I can take it or leave it myself, though I notice that it seems to be related to the size of the flowers -- bigger spathes tend to have more blistering than smaller ones -- and it seems obvious enough why large spathes would be desirable. and #244 ("Sara Problem") is a perfectly nice pink/pink, just like all the other perfectly nice pink/pinks. Except for some thrips damage. #202 ("Mason Pepperspray") is pretty tiny. For a few days after it first opened, the spathe formed a nearly-perfect hemisphere around the spadix. That's flattened slightly with age, but the shape is still unusual. The color's gotten lighter with age as well. I'm less happy about that. #110 ("Delta Badhand") is also very very small, and strongly resembles #116 ("Eileen Dover"), to the point where I wonder if both plants don't have the same parentage. (If they do, then they'd both be NOID purple x 'Orange Hot;' Delta's seed parent is the NOID purple and Eileen's is 'Orange Hot.') Unfortunately, I tore her spathe on the first day it was open, which I feel bad about. 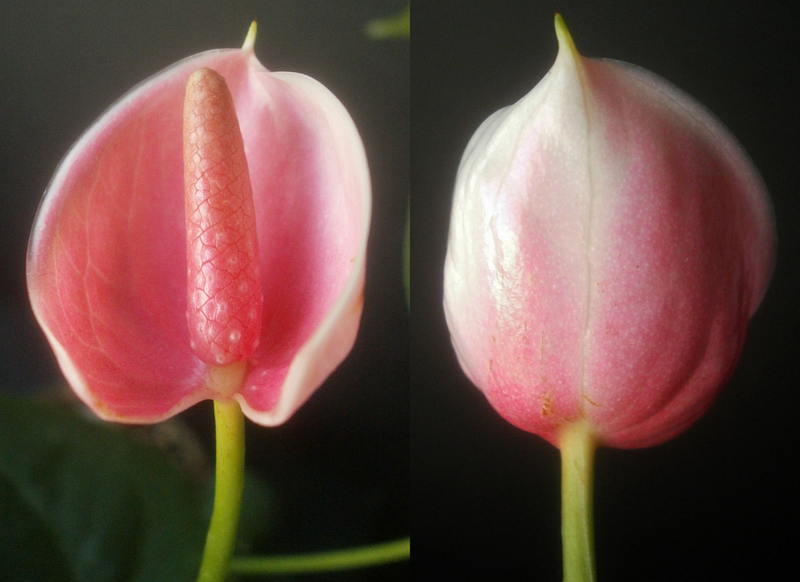 Carmen has since relaxed a little, so the spathe is more of a straightforward heart shape than the tulip shape here. In the couple weeks since I took this picture, the main veins near the spadix have darkened up. The book has some really pretty examples of that sort of thing; I'd be happy to see more contrasting veins. Carmen also illustrates our final vocabulary word, blush. Sort of. I found the book's explanation of blush difficult to parse. 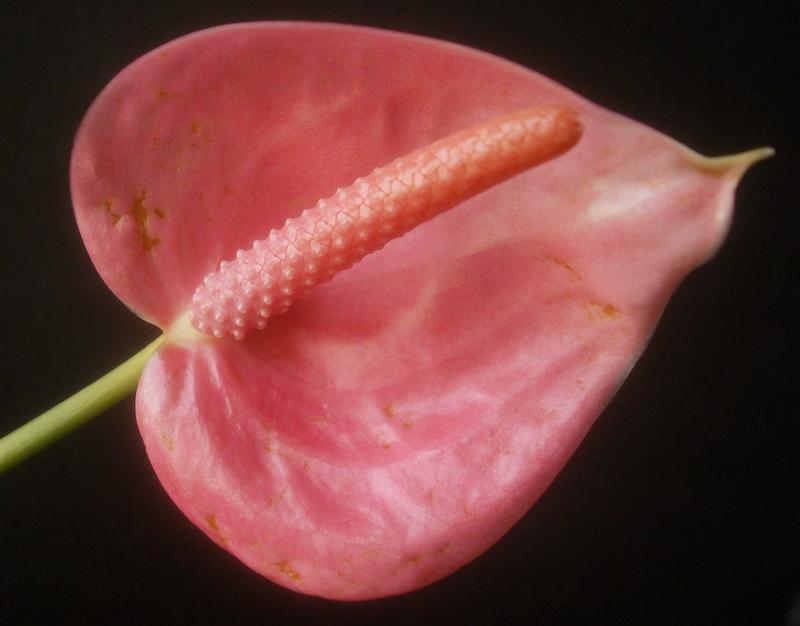 It's sort of an irregular splash of pink or coral color shading heavier toward the spadix, plus a darker version of the same color in the spadix. 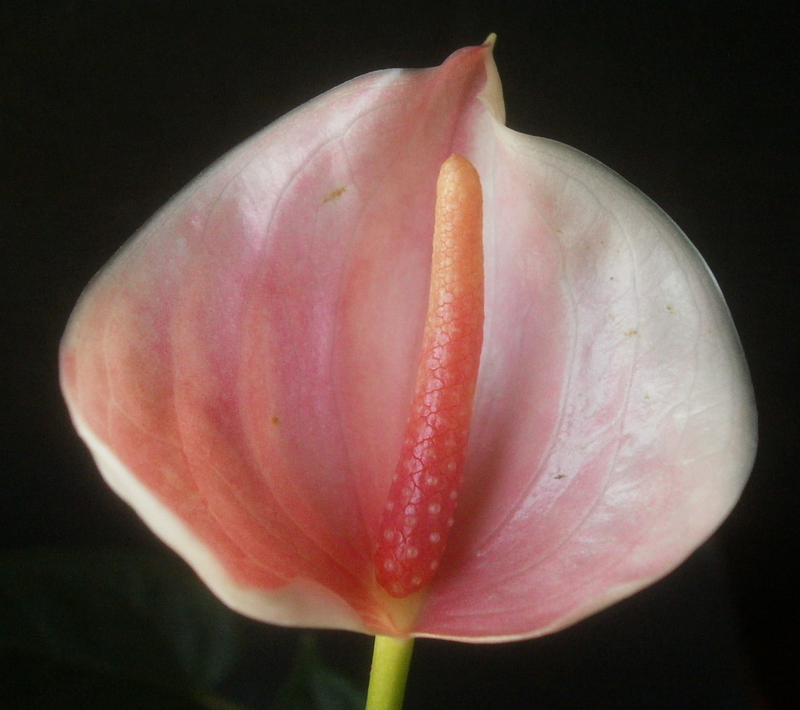 Blush isn't always visible when it's present: a coral blush will be hidden by a bright red spathe, and if the blush spreads far enough, it can be hard to tell the difference between a pink spathe and a white spathe with pink blush. 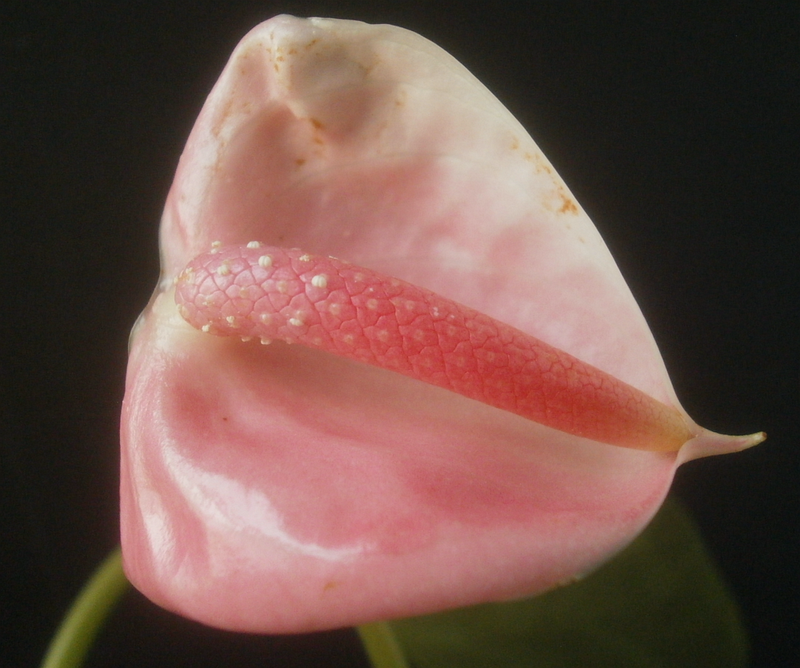 It's also not clear how dark a spadix has to be before it qualifies as blush: I infer that if there's any red or orange in the spadix, then you have a blush regardless of what the spathe might look like, but what about pink? 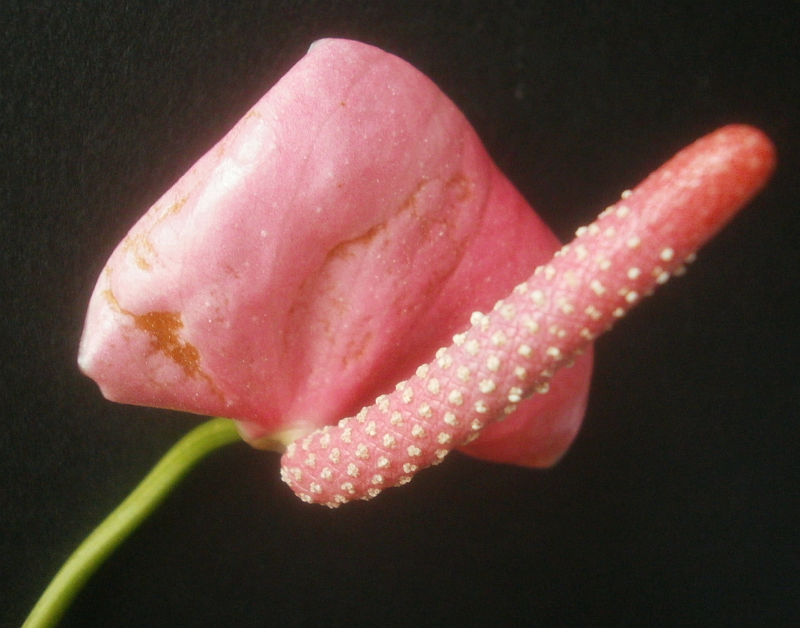 In Part 2, I'll try to sum up what I understand about Anthurium genetics. So Part 2 is gonna be really, really short. 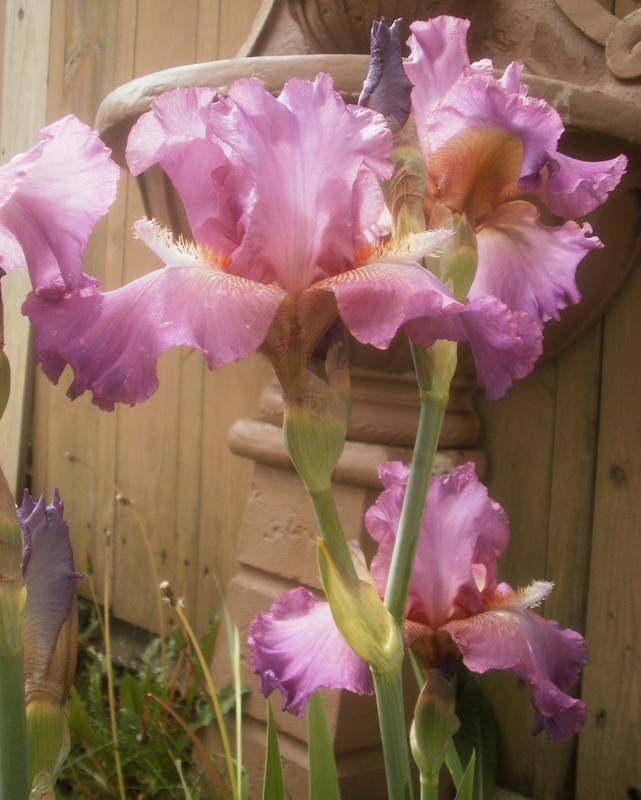 Not my own plants; this is the garden of the same person who had the yellow and blue Iris that I posted on Sunday. Regrettably, none of the photos accurately convey how many of them there were, all doing the visual equivalent of screaming their heads off. The display is kinda wonderful, though the one big failing of this particular kind of Papaver is how brief the blooming period is. Is someone working on breeding some that bloom longer? 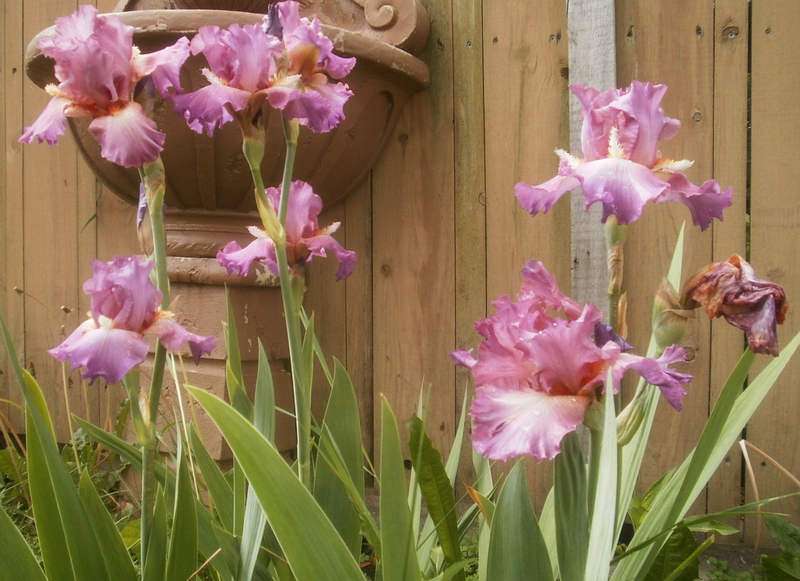 Or are there already some that bloom longer that y'all just haven't told me about? Pretty cool, though still not as good as the baby Pegasus in Tipton. I'm a little unsettled by the bird nest in the giraffe's neck. Birds will be birds, though. Probably unavoidable. I tried googling to see if I could find out anything more about the piece, but nothing came up. Worse, I was pretty lost when we happened across this, so all I actually know about it is that it's in a pretty nice neighborhood in Iowa City somewhere. You'd think someone would have said something about a life-sized (?) 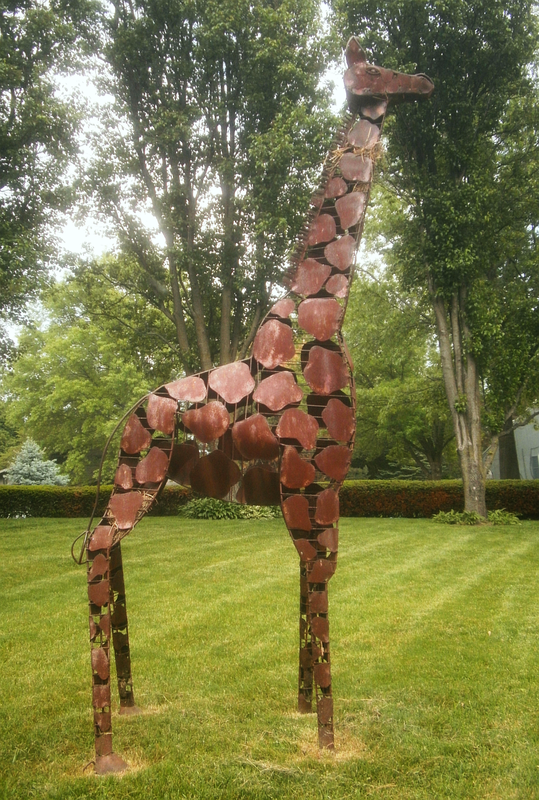 giraffe in Iowa City before this. Maybe it's new. Maybe Iowa Citians are just that jaded about art. Maybe there was an even bigger rhinoceros two blocks away that hogs all the attention. It's a mystery. I'm still trying to catch up with everything that's happened in the last few weeks. This is one of those things. 1) It just kind of came off spontaneously when I tried to adjust the stalk. (The stalk didn't actually fit into the shelf that the plant's been on since it came inside last fall, so from time to time I have to try to squeeze it back in there without breaking anything important.) It makes total sense that a pineapple's fruit would detach on its own, but for some reason this idea had never occurred to me before. 2) It smells so good. 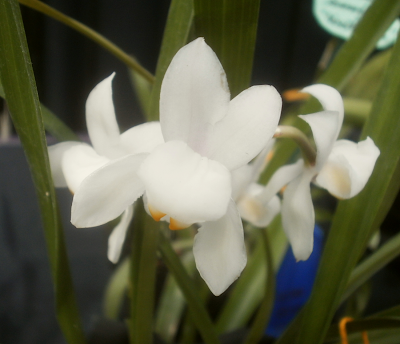 It's probably technically edible, but it's also very tiny, and not bred for taste ('Mongo' is an ornamental variety. 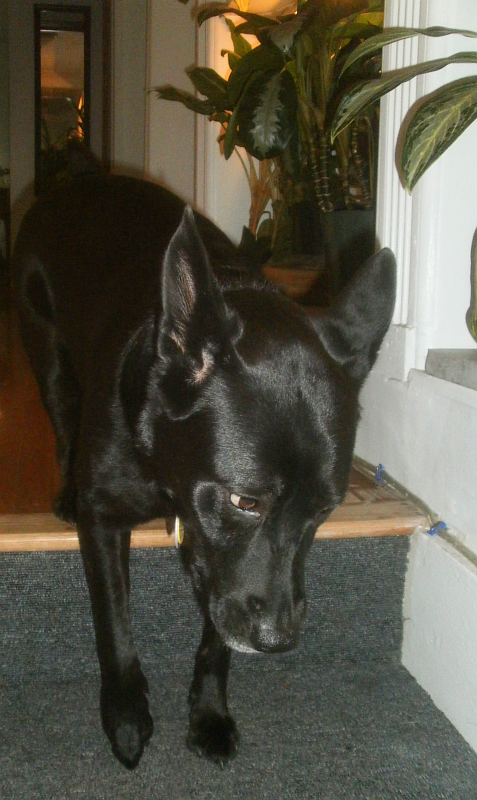 ), so I'm probably getting more from smelling it occasionally than I would from eating it once. 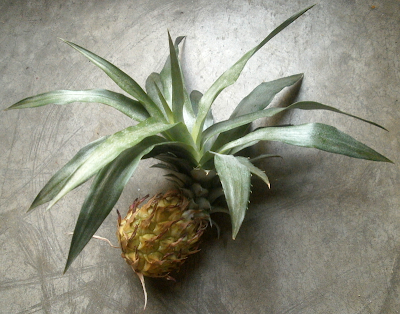 3) It's tiny, for a pineapple. The actual fruit, excluding the leaves, is only 2 1/2 inches (6.4 cm) long. The plant is probably not going to go outside this summer, because I remember how exhausting and unrewarding it was to be moving plants in and out all the time last year. Not that it was going to produce fruit again right away anyway, but that's probably going to slow down the development of offsets. 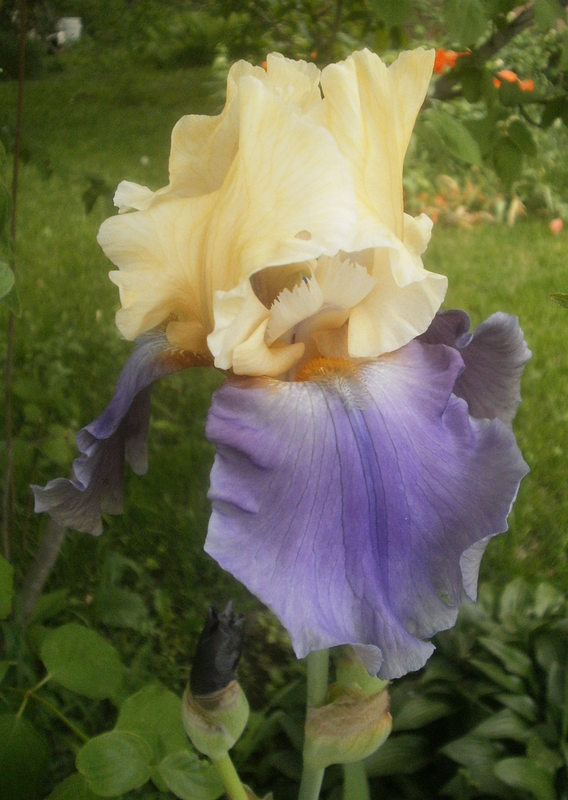 So last year, as you'll remember, I got two stalks of Iris flowers, on the NOID blue-purple plants, and that was it. 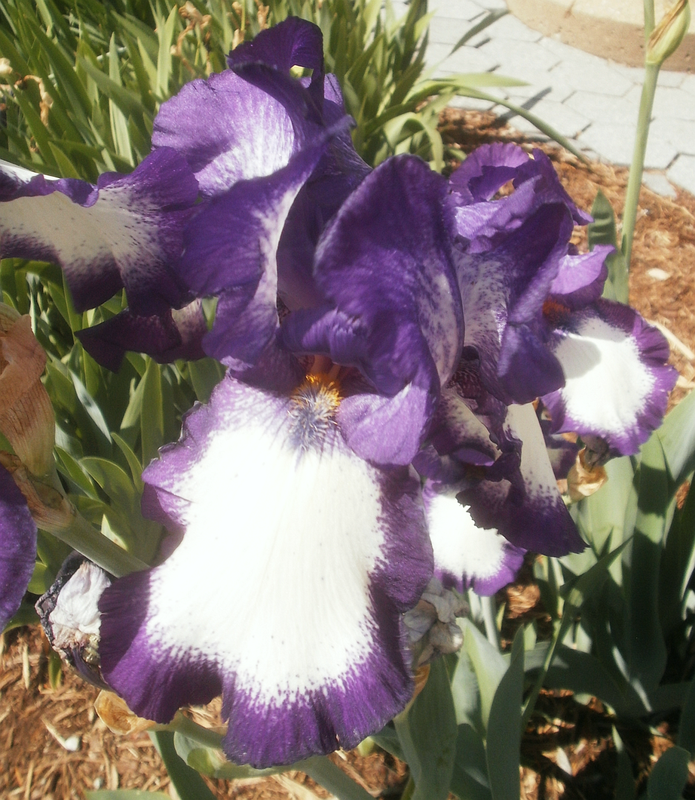 No other blooms, no other colors. 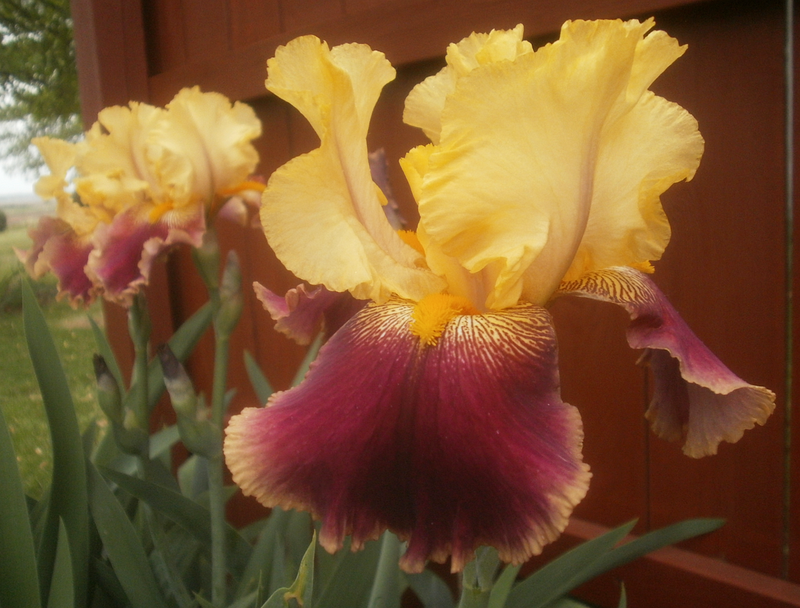 It's looking like that was mostly due to 2011's drought, because this year I got blooms on all the Irises except for the NOID blue-purple one. 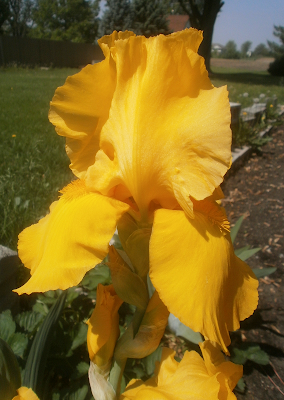 'Reincarnation' bloomed last fall as well (it's a rebloomer), but I apparently didn't blog about that even though I took the pictures. Go figure. 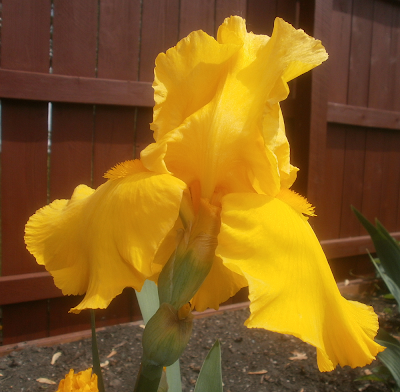 I'm not sure I was aware, prior to hearing about 'Frivolous,' that yellow irises could be bright dandelion yellow, as opposed to pastel gender-neutral-nursery yellow. But they can. Oh, how they can. Spotted here in town. 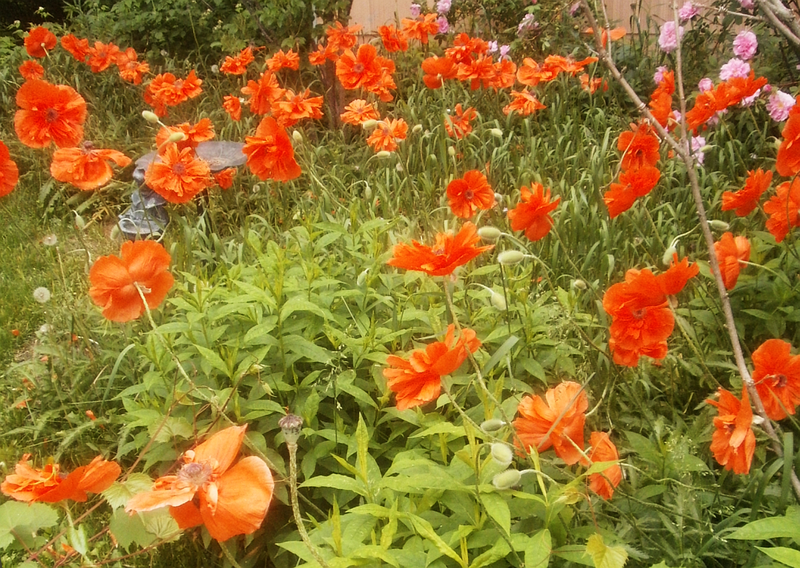 There was also a completely unreal number of orange poppies1 in this yard, which may or may not get a separate blog post later. 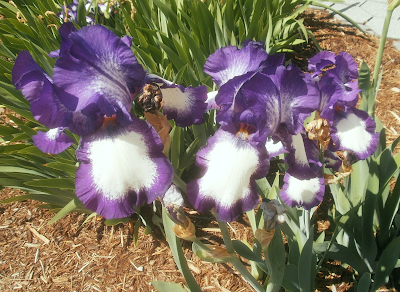 This purple and white combo from the University of Iowa Hospital would have been much more impressive if I had been able to capture the whole planting at once. There were other priorities that day, though,2 so the above are the only two shots I attempted. 2 Neither I nor my husband were the patient, and we're both fine as far as we know. The explanation for what we were doing there is long and complicated, has an unclear diagnosis and an ambiguous prognosis, and isn't something I feel like sharing with the whole internet, so that's all the explanation you get.